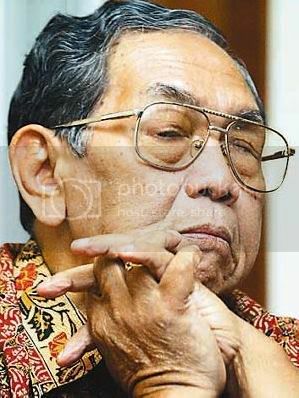 RIP to Almarhum Abdul Rahman Wahid aka Gus Dur. A blind (with wide-eyes in his heart) president, a moderate Islam leader on 30th December 2009 (1840 WIT). Almarhum faces many controversial issues in his life with lots of "Fitnah" from his surrounding. Lots of his people consider as an "extremist". When they're saying most bad things as right, terror attacked in Bali as Jihad.. what so ever. He knows everything is incorrect and didn't follow the true order from God. As every religions on this world said, we must LOVE each other and if you not going to LOVE others, you're not within God follower? He even criticized an Islam nowadays about how always waiting for "subsidy" from the authority not same like the Christians which doing everything by their own. To all Islam brothers/sisters, wake up and let's strive for success and never blaming others, look ourselves in front of the mirror first. Aren't we worshiping the same God? And here the photo, Almarhum Gus Dur sitting with Rabbi Daniel Landes (Institute of Jewish Studies, Jerusalem) and Sri Ravi Shankar (Indian Religious Leader) during Religion Summit being held at Bali in 12th June 2007. Don't we ever think hating other religion same like hating our relatives? Al-Fatehah to Gus Dur. I don't think Almarhum Gus Dur trying to "convert" Indonesia. If so, let God be the judge and not us. 1- Will always be with the weak side. 2- Anti-Discrimination in any form. 3- Never hate others even being hurt.